What is the best restaurant with a view of the harbour? There are so many great spots. Sometimes you want a night out to splurge with the company of friends and family. Any recommendations and price guides? I've heard of Aria. I love Matt Moran and his TV shows. Will definitely need to check that out. Blu Bar on 36 at the Shangri-La offers a nice view of the harbour bridge in a more intimate setting and their cocktails are interesting. 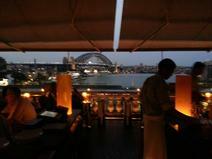 O Bar and Dining is also pretty incredible with spectacular 360 degree views of the harbour and city. Both are fairly reasonably priced considering the locations. Cafe Sydney has a spectacular view of the harbour - and spectacular food to match. If you don't mind abit of a splurge for a special occasion, 360 Bar and Dining in Sydney's Centrepoint Tower offers the most spectacular views of the city!